Thousands of Texans are being denied the chance to register to vote, violating federal voting laws, a new lawsuit alleges. 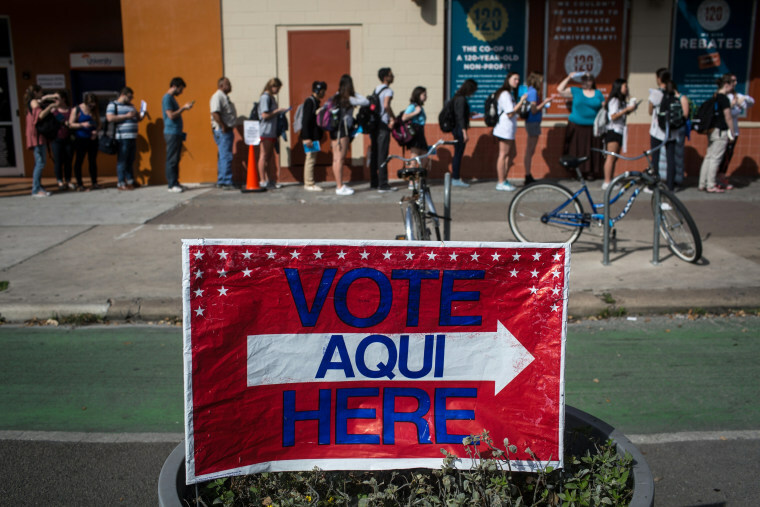 “Texas voters will continue to be shut out of the democratic process unless and until Defendants reform their registration practices,” alleges the complaint, filed Monday in a federal court in San Antonio by the Texas Civil Rights Project. Plaintiffs in the suit say they tried to update their drivers license and voter registration records through the website of the state Department of Public Safety, and believed they had done so. But when they went to vote, they were found to be unregistered, and forced to cast provisional ballots, which likely won’t count. The National Voter Registration Act (NVRA), which aims to make registration as easy as possible, requires that states give people the chance to register to vote when they come in contact with departments of motor vehicles, as well as public assistance agencies. In November, Alabama agreed in a widely praised settlement to comply with the NVRA and make registration easier through its drivers license agency, after the U.S. Justice Department threatened a lawsuit. A spokeswoman for Texas Secretary of State Carlos Cascos, who is named as a defendant, did not immediately respond to a request for comment. His office has said in the past that many of the voters who experienced problems have since been registered. The lawsuit says that, based on public records, Texas received complaints from more than 1,800 people between September 2013 and May 26, 2015. All wrongly believed they were registered after completing an online transaction with DPS. That’s likely just a fraction of the number of Texans who were denied the chance to register, the suit claims, since it includes only those who made formal complaints. Last May, Battleground Texas, a Democratic group working to register Texans to vote, wrote to Cascos charging that the state’s “voter registration failures are widespread and systematically undermining the right to vote in Texas.” Mimi Marziani, then Battleground’s legal director, is now executive director of the Texas Civil Rights Project. The lawsuit comes as Texas’ soaring Hispanic population threatens to shift the balance of power in the state. Around 2 million Texas Hispanics are unregistered, and just 39 percent of eligible Hispanics in the state voted in 2012, compared to 61 percent of eligible whites and 63 percent of eligible blacks. Texas already has the strictest voter registration rules in the country. Since 2011, non-Texans are barred from registering voters; anyone registering voters must undergo training through the county; no one can register voters in counties other than the county where they were appointed; and all voter registration applications must be personally delivered, rather than mailed. Meanwhile, the state’s strict voter ID law remains in effect despite adverse rulings from three different federal courts. The 5th Circuit Court of Appeals is set to consider a challenge to the law in May. The Supreme Court could have the final say.